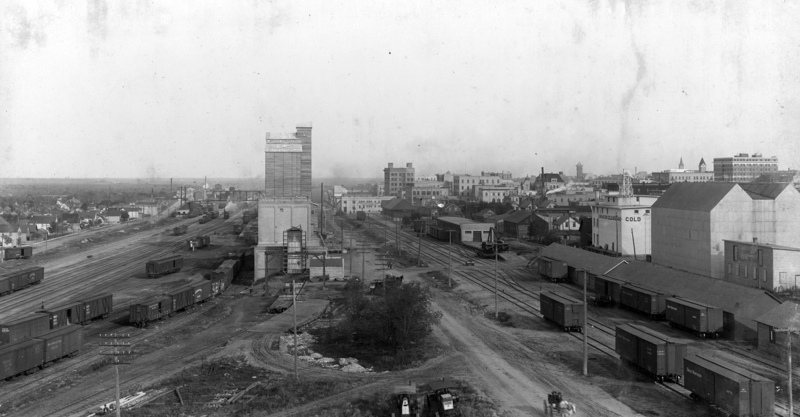 A historic view of downtown Brandon. Two Brandon University (BU) employees are honoured to be part of a team that has received a Manitoba Day Award for an archival photo project that was displayed last year. 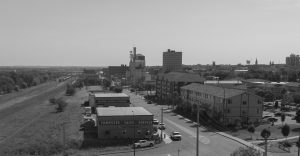 “Gowen’s Brandon: Then & Now” was a joint photographic exhibit produced by the Daly House Museum and the S.J. McKee Archives at Brandon University. Funded by the Manitoba Heritage Grants program, the exhibit featured 47 reproductions of photographer Frank Gowen’s historic images of Brandon paired with present day images of the same locations. A modern view of downtown Brandon, from a similar vantage point. Brandon University Archivist Christy Henry and researcher Morganna Malyon worked on the exhibit with Daly House Museum curator Eileen Trott and photographer Graham Street. Their project was recognized last week by the Association for Manitoba Archives at their 10th anniversary Manitoba Day Awards. Researcher Malyon said that she drew on everything from aging print directories to Google Maps to trace the history of buildings in the exhibit and it gave her a deep-seated appreciation for the history of Brandon. The exhibit was displayed concurrently at the Daly House Museum’s Exhibition Gallery and the Tommy McLeod Curve Gallery at Brandon University’s John E. Robbins Library from Jan. 22 to April 31, 2015. Street, who took the modern-day photos to accompany Gowen’s historic originals, also produced a documentary on the creation of the exhibit through MTS Stories From Home. The 10th annual Manitoba Day Awards were presented last week in Winnipeg.